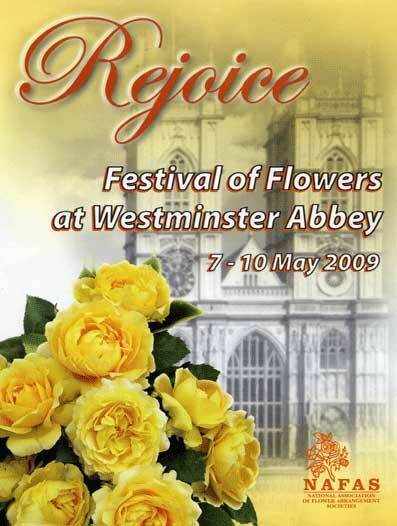 2009 is the 50th anniversary year of the National Association of Flower Arrangement Societies (NAFAS) and one of the special events being planned is a fantastic Festival of Flowers in Westminster Abbey from 7-9 May 2009. NAFAS has enjoyed a long and successful relationship with the Abbey and is delighted to be able to share this wonderful event with them. To set the scene, 300 flower arrangers will be arriving in London representing NAFAS Areas and Clubs throughout the United Kingdom. They will stage over 100 fantastic exhibits in one of the most prestigious venues in the world. A team representing each of the 21 Areas of NAFAS, arrangers from a club in each area and up to 60 individual designers will create this spectacle, many being sponsored by members, friends and associates of NAFAS. A special area featuring individual exhibits from our junior members will allow them the opportunity to show visitors the skills they have learned at their flower clubs. A donation from the Festival of Flowers will be made to Breast Cancer Care, which is the charity for our anniversary year. This is not a ticketed event, but visitors will be required to pay the normal entry fee for Westminster Abbey.